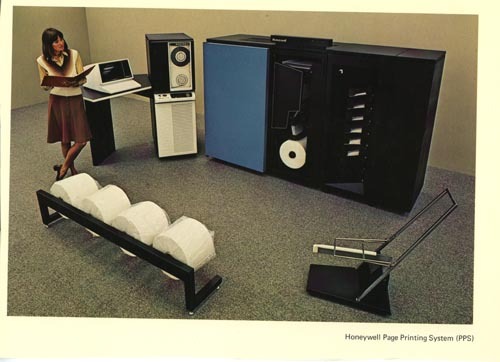 Color image of a Honeywell prrinting system. In the foreground are 4 large rolls of paper on a rack. A woman is standing in front of the console with a manual in her hands. The console hasa display-keyboard, a tape uniton top of the electronics cabinet. To the right is the printer with the paper roll and collator section visible. To the right front is an empty paper roll carrier.